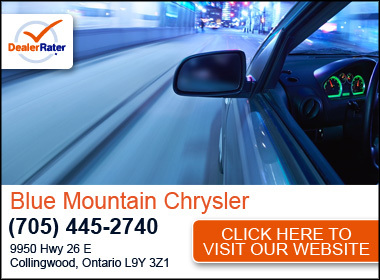 Blue Mountain Chrysler has been proudly serving the Collingwood and Blue Mountains area since 1974. We know that you have high expectations, and as a car dealer, we enjoy the challenge of meeting and exceeding those standards each and every time you visit us. It is our commitment to consistently provide you with the five star experience that you deserve through our Service First culture. We value trust, knowledge, commitment, convenience and care when providing our customers with a quality service and sales experience. Blue Mountain Chrysler is southern Georgian Bay's Jeep Central, with an expansive inventory level of all new Jeep model lines. We also carry the region's largest inventory of Ram trucks. If a used vehicle is what you're looking for, we have you covered with our extensive inventory of quality and competitively priced used vehicles. Feel free to browse our inventory online, request more information about our vehicles, schedule a test drive or inquire about financing. We have a strong and committed sales staff with many years of experience in satisfying our customers' needs. Our experienced sales staff is eager to share its knowledge and enthusiasm with you! 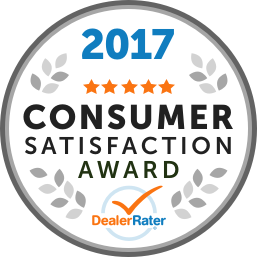 Needless to say, you cannot sell as many vehicles as we do at Blue Mountain Chrysler without an outstanding parts and service department. Our factory-trained technicians work hard to provide top notch care to keep your vehicle running efficiently and reliably, using our Service First Passport, from the day you drive your vehicle off the lot to the day you trade it back in with us! Come experience the Service First difference at Blue Mountain Chrysler! We look forward to serving you! Very knowledgeable staff. Shari was a pleasure to work with and helped us get the vehicle we wanted. Would highly recommend if you’re in the market for a new/used vehicle. Shari McKilligan was very helpful. I trusted what she said to me. She showed me what I wanted to see. thank you very much. Don. I purchased a used vehicle at Blue Mountain Chrysler in 2016. I agreed to a 3 year comprehensive warranty for an additional $3800 as well as an enamel undercoating package for $1000. I was to return at my convenience to get the car undercoated. The day I bring the car home I put it up on my hoist and thoroughly inspect the entire car, inside and out. I found a couple issues. The car was missing the owners manual, the roadside toolkit which includes the wheel lock, the cargo net, and the pet partition which the original owner may not have provided. Then I asked myself how they managed to do a safety on the vehicle without having the wheels off to check pad and rotor thickness. I looked at the safety they gave me and it said they replaced the front brakes. I have a look and sure enough there are new pads and rotors installed. So they must have had the wheel lock tool from the car and just not put it back. I called the dealership and asked to speak to the salesman and told him my problem and he proceeded to tell me they never replaced the front brakes on the car. The salesman told me this over the phone, as I was holding the safety that explains exactly the opposite of what he's telling me. I asked him how they checked the thickness of the pads (which is a requirement by law) and he told me they have a wheel lock kit that fits all their Chrysler cars. This wasn't a Chrysler car. So you either didn't have the wheels off and never replaced the front brakes, or checked the thickness of the pads or the rotors and the technicians just felt like adding work to the bill, or the technicians DO have the tool and did all the work described, but decided to keep it for their own use. Pretty cheap on their end. I just spent $21,000 on a used car from your dealership and you cant even provide me with the owners manual and the wheel lock, even if you had to go and purchase it so you could sell the car complete, that's how you keep customers coming back. After a couple weeks I booked an appointment to have the car undercoated. I arrived at 9am sharp only to be told one of the techs was going to be driving my car somewhere else to get it undercoated. I had just spent an entire weekend detailing the car and it was absolutely spotless and now some filthy tech is going to be driving it across town? Great. I waited 4 hours beside an older gentleman who was chatting to me about his recent brand new Chrysler 300 purchase and how this dealership has been nothing but a headache. GREAT. When the tech comes back I get my keys and leave. I go straight home and put the car on my hoist. WOW, The $1000 undercoating package covered the bottom of the front and rear subframes ONLY. There was no undercoating on anything else, absolutely nowhere. Nothing. There were no holes drilled in any of the doors, or the rocker panels, or anywhere. The drivers seat was oily, the door jambs were filthy, does nobody take pride in their work anymore? Such a shame. I should have billed them out for my detailing service as I do take pride in my work, and my time has value something your dealership can't comprehend, because as I left that day the older gentleman I was sitting beside was still waiting for his HVAC repairs. What a joke. Two months go by. Middle of winter, driving to work in the morning and the steering in my car gets stiffer over the course of my 50km commute. It gets to the point that it seems like the power steering pump had quit and I have to use both hands to maneuver the wheel. I had the licensed mechanic at my work go over my car and by lunchtime he told me the intermediate steering shaft as well as the steering rack are both seized. I call up Blue Mountain Chrysler and speak to Phil about the possibility of the warranty covering this issue. Phil told me that both of those items wear out after about 100,000km of normal driving. I'm not a mechanic but I play one on TV, LOL. Regardless I checked through the entire contract I had with the warranty provider and it clearly states both of those parts are covered, but by discretion of the dealer. GREAT. Phil's just going to deny any/all claims I have on the car. LOL what a waste of $3800. Blue Mountain Chrysler never ended up calling me back about this matter and I just ended up going to another dealer in Barrie and ended up spending $900 to have the intermediate shaft replaced and another $1400 to have the rack replaced. A year goes by. Driving home from work one day I get an error on the dash about my alternator. Great, I get to deal with BMC. Before I called I looked through my AutoXTRA contract and noticed that it states the alternator is covered. GREAT, because it's a $900 alternator. I called up Phil and told him my issue and he tells me to bring the car in. I know where this is going. I brought the car in, and waited in their lobby for 2 hours, to have Phil tell me they're not going to cover the alternator because it's a "wear 'n tear item". I can't even argue because once again this warranty states its up to the dealers discretion. At this point I promise myself I'll never step foot on this property again. What a waste of time and money. LOL So now here I am today. Writing this because 3 months ago my car was written off because someone came down my street and lost control and hit my parked car. I went through my AutoXTRA warranty and noticed that I can be reimbursed for the remainder of my warranty that I didn't use. GREAT. I called up AutoXTRA and they told me I have to do all this through the dealership I purchased the car at. GREAT!!! I filled out all the paperwork AutoXTRA provided me and brought it in to Phil. I didn't hear anything for weeks. I go back in to BMC and see Phil, he completely forgot. Lost my paperwork didn't make any calls on my behalf. I have copies on my phone and email them to him while I'm standing in front of him. Nothing for weeks. I called BMC today and ask for Phil. The receptionist tells me Phil no longer works at BMC, LOL of course, right?!?!?!?! That would explain everything. The receptionist asks if I would like to speak to Phil's replacement. Phil's replacement doesn't know what I'm talking about, or where my paperwork or emails went, and assured me that I'm to do this entire process through AutoXTRA. AutoXTRA has told me numerous time this is to be done through the dealership where I purchased my car. GREAT. I basically have to start this whole process over again. Once again what a waste of time and money. I'm still waiting for a phone call regarding my payout. LOL Save yourself the headache, go somewhere else. wanted to get a used Jeep Wrangler- contacted Aaron Hawkins and he found me on within a week - he was informative and communicated with me very well via email and phone. I am now in my new Jeep and loving it. Thanks so much. "Used MINI cooper purchased "
Travelled almost 5 hours to view and test drive car. After some initial concerns of engine reliability Jamie from sales did his own research and and agreed with me. He went to bat and got all things I asked done to make the sale at a price I was happy with. It took a while to get everything done but I wasn't in a hurry and was looking for a play car. I will be buying a new truck in one to two years and will be traveling back to blue mountain Chrysler from way down in Windsor, to get it. Thanks Jamie and Aaron in the sales department. I've read some other reviews regarding prices of parts and attempts to fix things. First all part numbers are the same for replacement parts, mopar or aftermarket. Dealer parts are usually an exact fit and replacement to your make and model. Aftermarket parts are a gamble sometimes and you get what you pay for. Dealer parts will always be from the dealers manufacturer no matter where you buy. These parts are usually up to ten times what you pay for aftermarket parts. THIS HAS BEEN THE CASE FOREVER!! Daelers are tied by contract to that manufacturer's parts. There is no secrecy or scam here. Again very happy with the purchase and the help from the sales and service departments. Very helpful, caring group of guys! I didn't have to test drive too many....It was exactly what I was looking for :) Highly recommend. My husband and I were impressed by the quality of customer service provided by Shari McKilligan, and the rest of the dedicated staff at Blue Mountain Chrysler in Collingwood. She made a great effort to answer all of our questions or concerns, and was quick to find out the answer if she didn't know it. Shari is an employee who wants her customers to be happy. and works hard to make that happen.